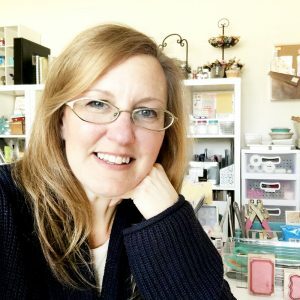 Hi everyone, today I am so excited to begin a brand new series with you all about current collections and how to use your collections as a jumping off point for layouts! In this video I am unboxing Dear Lizzy Stay Colorful and sharing 5 prompts for layouts that you can use to create your layouts as well! 1.Pull your favorites. I say this all the time: Use your favorite products!!!!! Go ahead and pull them out while it is fresh and while you are in love with them! And make a layout. Make two. Have fun with those products that made your eyes sparkle and made you press the buy button. 2. Look for common products, common shapes, or common shapes. Anything that goes together in the collection can be a great starting place and I just love a pretty layout with a cluster of products, don’t you? Hey remember this layout? 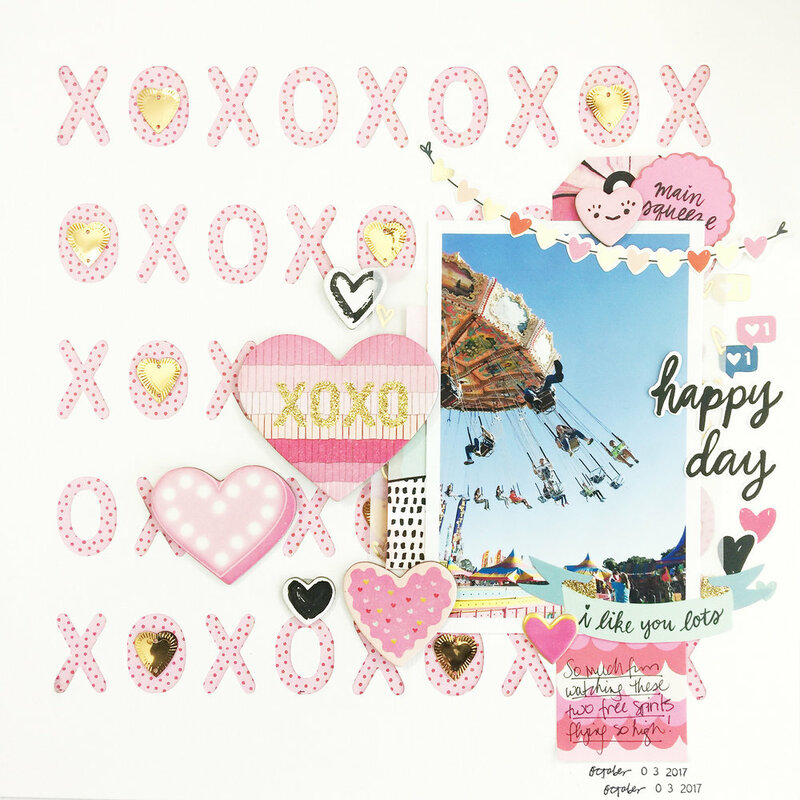 That layout was created because I wanted to use all those beautiful chipboard hearts on a layout, and they look stunning all together on the page. 3. Think about what the collection reminds you of? When I receive a collection in the mail, I love to pull everything out of the packaging and just play with the different elements on my worktop. I like to layer things together, try different products beside each other, just play. This is so much fun, no commitment, no pressure. And this is a great time to think about what the collection brings to your mind. Are there memories or places or people or things that it reminds you of? Those are instant starting points. 4. What is a theme that jumps out at you? Typically collections have a theme and it is usually pretty easily recognizable. Sometimes they add little unexpected elements to the collection, and I have another fun little trick. Sometimes I like to use a collection for precisely the opposite thing it was designed for! Ha! 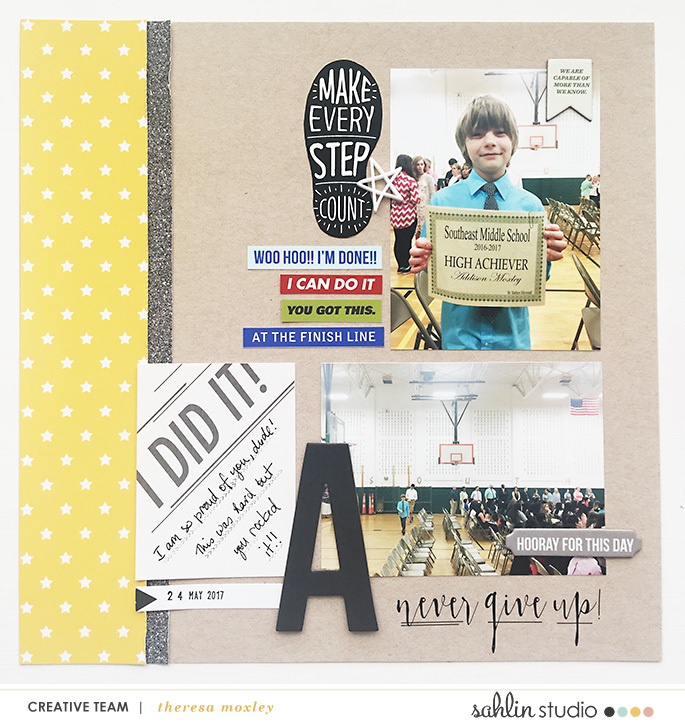 A great example I have of this is this layout I created using the Sahlin Studio Run collection. I didn’t have any “run” type photos, but I did have a great photo of our son graduating from middle school. This gives your collections much more mileage than you might think! 5. Keep a running list of the projects you are working on + the products as they arrive at your door. This is my best trick for making sure I actually use my products. I keep these two running lists and when products arrive, I automatically consult my project list and plug the product in. In fact, if I am able to I like to try to use each collection in each project. That makes my inner warrior scrapbooker so happy! Ok, friends, that is all for today. Stay tuned, as this is a new series and I will be sharing my process videos for this collection in the next few weeks! And then we will select another collection and do it all over again! Let me know what collections have caught your eye this season!